Here it is, October 5... And I spent four hours watching what is probably our last osprey here in the Twin Cities. 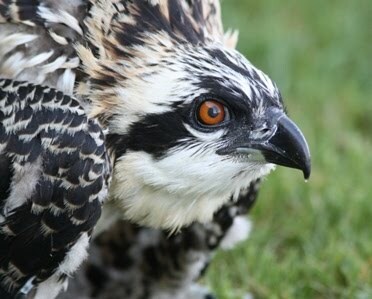 Our family of late fledgers has lingered much later than most other ospreys and it's been educational to observe them. Last Sunday I was watching the two chicks, one male and one female and their Dad. That turned out to be the last time I saw the male chick. All week we have been watching the female chick being fed by her Dad, food begging, never venturing far from the nest. The last two days she has been quieter and we cannot confirm that the adult male is still around. We have not seen him. But today the female was still on the nest or in a nearby tree, food begging occasionally , tho I am not sure who she saw that elicited that vocalization. She disappeared for a while and came back all wet. Was she trying to catch a fish for herself? Perhaps, or maybe just bathing. Her crop was fairly empty, and she only pooped a small amount once in those four hours. She did not appear to be dehydrated. One can't help but ponder what this experience is like for these youngsters , to feel the urge to fly off to parts unknown, without a parent, having rather undeveloped fishing skills. This is why it is estimated that half of them will not survive the first year. It's difficult for those of us who have become attached to these birds we have watched for so many months. After four hours of observing her, she took off to the south...going fishing? Or is she off on the big adventure this time...time will tell. Barb and I will keep checking. I hoped that Dad would stay, but it is late and I guess the switch finally flipped in his head and the urge to head south won out over the instinct to care for his offspring. We hope she will follow soon, while she still has reserves built up from all the fish he has delivered so faithfully. We hate to see her go, but she must. Here is a touching excerpt from a lovely email I recieved from Karen, who watched over a family of ospreys all summer. I think it expresses what many of us feel this time of year..."Today is quiet, almost eerie... Last night my little lady was on her favorite perch off my front porch/deck. All week long she has been staying close to home and begging for food like she was starving...As evening comes I still don't see her. By now she is usually hanging around close to home. I think that day...the day I knew would come..all too soon. Is my girl gone? I have grown very attached to this little lady. I know her call, I can spot her a half mile away. I have mixed feelings....she is grown, ready to explore her world, I am proud of her. Sad that I will most likely never see her again. This summer went all too fast. I cherish the photos we have taken. I look forward to next year and what it will bring. Thank you for sharing your passion with us, teaching us." Once again, I have to say thank you to all the amazing people who have helped watch over these birds all summer, sharing your observations with me, investing your time and your hearts in our Ospreys. A million thanks.